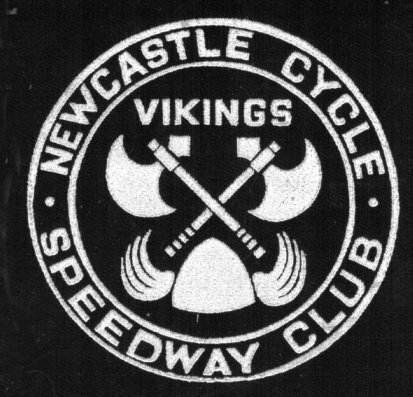 There was little personnel change for the Newcastle Rebels at the beginning of 1986, and it was looked on where the team could be really pushing for honours. As well as a full league and cup programme, the Eastfield track was to see its biggest ever meeting. One of the major events of the year was the annual 4x team tournament between England, Scotland, Wales and Northern Ireland. Top riders from all over the country travelled to Newcastle on Friday 8 August for the event. An excellent meeting saw Scotland win by 2 points from the favourites England. Note: Riders in the Division 2 meetings have 5 rides unless stated, in Combination matches it is 4.
usually when a rider takes part in both meetings. Points scored in the main meeting are added to the opposition team total. The match score is shown, with the amended (official) score in brackets. Penalised riders are shown in red. Another rename to the league, now called British League North Division 2. The season started as usual against Hull, this time in the first round of the cup, open to Division 1 and 2 sides. Rebels started on a winning note. P Schofield 18, A Schofield 17, B Ashton 12 (4), M McGowan 7, A Craven 7, C Baker 6 (4) J Irvin 5, G Gibson 4. John Wilson 17+1, Brian Mills 15+1, Andy Murray 15+1, Dave Yeardley 14+1, Michael Parr 14. Paul Marshall 13+3 (4), Stuart Craig 9 (4), Terry Kirkup 5+1 (3). G Gibson 10 (3), J Irvin 9+1, C Baker 8 (3), L Smith 5, P Burgdine 4+1 (3), N Middleton 4. Dave Lamming 16, Gavin Parr 16, Jason Keith 12+4, Martin Heath 11+1, Michael Jacques 11+1, Graham Heath 6. The team travelled to Chesham for their first league match, and were well beaten, two falls by no.1 Michael Parr didn't help matters. There was a win for the Combination team. G Bailey 11+2 (4), M Lewis 10 (4), S Mann 5 (4). M Parr 14, D Yeardley 9 (4), B Mills 9, J Wilson 9, P Marshall 8+1 (4), S Craig 8 (4) A Murray 8, D Lamming 5+1 (3). G Bailey 16, S Mann 13+1, P Lyons 10, J Richards 8, M Graham 6, S Mountaine 6. G Parr 13+2, J Keith 13+1, T Kirkup 13+1, M Jacques 11+1, M Heath 7+1, G Heath 4. The first home meeting of the season resulted in a comfortable win for Newcastle over Stockport, with solid scoring throughout. The star was Stockport's Frank Finnigan who rode unbeaten. The Combination team slipped to a surprise defeat in a close match. Newcomer Campbell McIver made a spirited debut. B Mills 17+2, D Yeardley 15+1, P Marshall 14, S Craig 13+2 (4), J Wilson 11+3, A Murray 11, D Lamming 10+2 (3), M Parr 9+2. F Finnigan 20, T Norman 12+1, L Phillips 10, P Williams 8+2, S Robinson 8+1 R Hayes 8, B Blackmore 5 (3), M Simms 3 (3). J Keith 11+1, G Parr 11+1, M Jacques 11, Campbell McIver 11, M Heath 6+1, G Heath 5. M Simms 13+2, R Williams 13, M Williams 11, D Ashcroft 10+1 B Blackmore 10+1, J Jenkins 5. The second round of the Gold Cup saw Newcastle travel to Heckmondwike, who raced in the league above, so on paper had little chance of success. However, an inspired performance saw the meeting go to a last heat decider, and a shared heat led to meeting ending all square, and a replay needed at Eastfield The home team had the top scorers in Clarke and Darren Kent, but the visitors were solid throughout, hero was reserve Dave Yeardley, who replaced Parr in the final race and came second, with Mills behind him. I Clark 19+1, D Kent 17+2, M Kent 15 (4), M Webster 15, L Crouch 10 S Blair 8, A Ellis 4 (4), S Webster 3 (2). A Murray 14+1, J Wilson 13+1, D Yeardley 12 (4), M Parr 11+2 (4), S Craig 10+2, B Mills 10+1, P Marshall 10+1, D Lamming 9+1 (3). Chesham were next to visit, and they went away pointless in both meetings. The curse of the statistician struck with a dead-heat in heat 12 for first place between Parr and Steve Mills. Star performer was Chesham's Martin Zuk, who rode unbeaten, but had little support. B Mills 15+3, D Yeardley 14+1, A Murray 14(4), S Craig 13+1 (4), M Parr 13.5, P Marshall 12, J Wilson 7+2, D Lamming 5+1 (3). M Zuk 20, S Mann 12, P Graham 11, S Mills 10.5+1 M Hack 10+1, S Bailey 7,P Mann 5+1, S Mann 5. C McIver 7+1 (3), D Summerill 5+1 (2). S Mills 15, S Mann 13, S Mountaine 7, M Graham 5+1, P Lyons 4, G Clements 4. 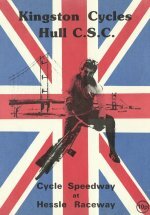 18 May 1986 HULL v NEWCASTLE British League North Division 2. Away - Won 98-81. P Schofield 19, A Schofield 18, B Ashton 12, A Craven 9, J Irvin 8+1 (4), A Moody 6+1 (4), M McGowan 6, G Gibson (3). M Parr 20, A Murray 15+2, B Mills 14+3, D Yeardley 14+1, S Craig 12 (4) J Wilson 10+2, D Lamming 7+2 (3), P Marshall 6 (4). 18 May 1986 HULL v NEWCASTLE British League North Combination. Away - Won 73-46 (84-46). A Moody 11, G Gibson 10, S Legg 9, J Baker 7, L Smith 5, H Middleton 4. A Crawford 7+2 (3), C McIver 6 (3). 31 May 1986 NEWCASTLE v WEDNESFIELD "B" British League North Division 2. Home - Lost 85-92. Wednesfield (Wolverhampton) made the long journey north worthwhile by taking the win in the Division 2 match. There was little to choose between the sides, Wednesfield's top 3 just edging it. The combination team were again successful. M Parr 17+1, A Murray 15+1, J Wilson 12, P Marshall 11+1 (4), D Yeardley 11+1, S Craig 8+1 (4), B Mills 6+1 D Lamming 5+2 (3). Andy Melbourne 19, A Palmer 18, M Pedley 15+1, K Turley 14+1, S Woodward 9+1, J Smith 8+1, Ade Melbourne 7+2, N Perry 2 (1). J Keith 15.5, M Jacques 13+2, C McIver 9+1, C Bannon 9+1 (3), G Parr 7, A Crawford 6+3 (3), L Marshall 5 (3). N Perry 15.5, A Sault 11+1, S Woodward 10, L Pearson 8+1, J Haycocks 5, M Bodley 4. 1 June 1986 NEWCASTLE v HECKMONDWIKE Gold Cup Round 2 (replay) Home - Won 89-84. The replay of the Gold Cup round 2 was next up at Eastfield, with Heckmondwike looking for revenge following the surprise draw the previous month. Another close match was expected, and so it proved as after 16 of the 18 heats, the scores were level. Disaster then hit the visitors, as they had no finishers in heat 17, and the Rebels were through to the next round. Although there was little between the sides, Newcastle just edged it at reserve. A Murray 16+1, M Parr 16, S Craig 15, D Yeardley 10+2, J Wilson 10, P Marshall 9+1 (3), B Mills 7+1 (3) , D Lamming 6 (3). D Kent 16+1, I Clark 13+3 (4), M Kent 13+2, M Webster 12 (4), F Rothwell 11, P Dyson 10+1, L Crouch 5 (4), D Lunn 4+1 (3). In good heart, Newcastle arrived at Stockport the following week and despite a Frank Finnigan maximum, came away with another away win. The meeting was won by the last race, and allowed the Rebels to use the reserves in heat 18. The Combination team were also winners led by maximum man, Dave Lamming. F Finnigan 20, L Phillips 15, T Norman 14+1, P Williams 10+2, B Blackmore, 9 (4) D Ashcroft 7, M Williams 5+1 (2). D Yeardley 9+2, J Keith 7+1 (4), G Parr 5. M Williams 13, R Williams 11+2, B Blackmore 10, D Ashcroft 9+1, D Blackmore 7+2, D Bower 5. D Lamming 16, T Kirkup 15, M Jacques 13, C Brannon 9+1, A Crawford , L Marshall 5. Wednesfield completed their second win over Newcastle with a comprehensive display. 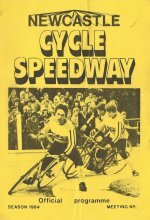 Newcastle were no match for the Wolverhampton side who had 3 unbeaten riders, Palmer, Pedley and Andy Melbourne. Michael Parr was best for the Rebels. The combination team won an exciting meeting by one point on track, but had 9 penalty points to add. A Palmer 20, Andy Melbourne 19+1, N Pedley 15+5, K Turley 15, K Nutting 11+2, N Morris 10+2, J Smith 9+1 (3), Ade Melbourne 9 (3). M Parr 15, D Yeardley 12+1, P Marshall 11, A Murray 9+1, B Mills 9, J Wilson 7, D Lamming 4, M Jacques 4. Ade Melbourne 16, N Perry 15, S Woodward 12, L Pearson 6+1 J Haycocks, 5+1 M Bodley 5. L Marshall 5+1 (3), T Kirkup 2+1 (1). Hull were having a difficult season, with poor results, and a shortage of competitive riders. 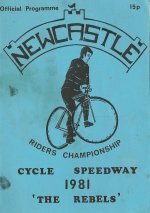 They arrived on Tyneside with only 7 riders for both meetings. The main meeting was an easy win for the first team, while Hull forfeited a massive 49 penalty points in the Combination meeting. P Marshall 18+1, G Parr 16+1, J Keith 16, M Parr 15+1, A Murray 13+3, D Lamming 11+2, J Wilson 10+1 (3), S Craig 8+1 (3). A Schofield 14, B Ashton 13, P Scofield 12+1, A Moody 11, H Middleton 8+1 (7), R Baker 7+1, J Baker 5. T Kirkup 14+1, C McIver 12+1, A Crawford 12, L Marshall 11+1, M Jacques 10+3, C Brannon 10+2. A Schofield 16, B Ashton 13, A Moody 6, H Middleton 5, J Baker 5, R Baker 4. It's not often that a meeting ends in a draw, however this was Newcastle's second this season. This was very close throughout and the scores were level going into the final heat. Andy Murray was replaced by reserve Michael Jacques who was having a rare first team match. He was an instant hero as he was team ridden by Michael Parr to finish second ahead of Sheffield's Sean Cadman. Sheffield had the edge at their top end, while Newcastle's reserves were far superior to their counterparts, The Combination team continued their winning ways with a 20 point victory on the track. M Gamble 19, C Turner 18, G Stringer 16, J Burke 14+3, S Cadman 9+1, A Sawbridge 6+1, I Oxley 4 (3), I Willoughby 3. S Craig 16+1, M Parr 16, J Wilson 15+1, P Marshall 10+1, J Keith 10+1, M Jacques 9+3, A Murray 7+1 (3), G Parr 6 (3). J Burke 16, I Willoughby 8+1, I Oxley 8+1, A Knowles 7+1, J Knight 5, M Sellwood 4. T Kirkup 14+1, D Lamming 14, C McIver 13+2, A Crawford 13+2 C Brannon 9+2, M Reid 5. The visit of Sheffield was another instance of a team arriving with only seven riders for both meetings. Not surprisingly Newcastle won both meetings with ease. Chris Turner and Martin Gamble only dropped one point each in the Division 2 clash, while in the Combination meeting the team won easily on track and were gifted an enormous 57 penalty points. M Parr 18, S Craig 15+2, J Wilson 14+2. B Mills 14+2, J Keith 14, A Crawford 8+3 (3), P Robson 8+1 (3). C Turner 19, M Gamble 19, A Sawbridge 12, I Willoughby 8, P Shale 7, D Clegg 6, P Meyer 5. T Kirkup 14+1, D Lamming 12+2, C Brannon 1+1, M Reid 11 +1, C McIver 10+3, A Crawford 10+2. Newcastle made their second visit to Chesham, but had to concede defeat again with just 3 riders managing to get into double figures. Steven Jones was unbeaten for the Comets. The Combination team again managed a win, by 4 points on track, and 28 penalty points to add. S Jones 20, S Mills 16, M Hack 16, P Mann 15, G Bailey 11+2, M Lewis 10+4, S Mann 9, S Mountaine 1 (1). J Wilson 16+1, M Parr 15, A Murray 15, B Mills 9+2, P Marshall 9, J Keith 7+1, S Craig 5 (3), D Lamming 3 (3). S Mann 16, M Lewis 16, P Lyons 9, S Mountaine 8+1 M Doubtson 5, G Heywood 4. T Kirkup 13, A Crawford 13, G Parr 11+2, C Brannon 10+3, M Jacques 9+2, M Reid 6+2. 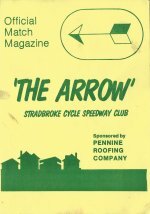 27 July 1986 Stockport did not travel for this league fixture, and forfeited the league points. A challenge match was held instead, see below in " miscellaneous meetings" for details. Hull were having a poor season, and a rampant Newcastle squad took their 5th victory of the season over the Humberside team. This was Hull's best performance of the 5 meetings, with decent efforts from their top 4. Andy Murray was star man remaining unbeaten, the rest of ` providing solid back up. Unusually, both teams rode with different riders for the Combination meeting, Rebels running out easy winners. P Schofield 17+1, A Schofield 17, B Ashton 15, A Moody 14+1, P Adams 8, M McGowan 5, J Irvin 4 (3), G Gibson 2 (3). A Murray 20, M Parr 16+1, S Craig 14, B Mills 13+3, J Keith 10, G Parr 8+2 (3), P Marshall 8+2 (4), J Wilson 7+1 (4). C Baker 14, J Baker 9, A Crickmore 8, R Baker 5+1, M Brownlee 5, H Middleton 4. S Neil dnr. A Crawford 15+1, D Lamming 14+1, M Jacques 13+2, L Marshall 10+3, M Reid 10+1 (3), C Brannon 9, T Kirkup 4 (1). Sheffield were next to visit Eastfield, and the Rebels took another straight win. Showing their trade mark strength in depth scoring, they took the meeting by 25 points. Andy Murray was top man with a paid maximum. Chris Turner was excellent for Sheffield, only dropping a point to Murray in heat 3. An inexperienced Sheffield Combination side put up a gallant performance, and with the bonus of 25 penalty points almost pulled off a surprise win, Rebels with 3 riders unbeaten won the meeting by 8 points. A Murray 19+1, J Keith 17+1, M Parr 15+2, G Parr 13+2, B Mills 12+2 (4) J Wilson 9 (4), M Jacques 8+3 (3), S Craig 8. C Turner 19 , M Gamble 13+2, J Burke 12+1, S Cadman 9, D Robinson 8, G Stringer 7+1, M Knowles 3 (3), A Knowles 3 (3). L Marshall 16, A Crawford 14+2, C Brannon 14+2, D Lamming 11+2, G Parr 11, J Wilson 10+3. J Fox 9, J Knight 8, I Willoughby 7, A Flaherty 6+1 (3), P Walker 6 (3), D Clegg 4+1(3), N Morton 3(3). The next day saw the visit of top flight side, Sandwell from the West Midlands in the quarter final of the Gold Cup. 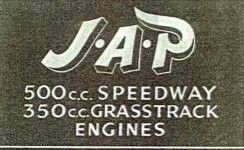 For the meeting, Rebels replaced Gavin Parr and Michael Jacques with Paul Marshall and Dave Lamming. Newcastle were on the back foot from heat 1, and by the end of heat 5 were 16 points down. The faster gating Sandwell side ran out winners by a massive 40 points. For the visitors, Shipley and Harcoat were unbeaten, while only Wilson (1) and Mills (2) were heat winners. A Combination challenge match was also held, and resulted in a close match with Newcastle giving away 9 penalty points, and just losing by 3 points. B Mills 13+1, P Marshall 11, J Wilson 11, J Keith 9, M Parr 7+1 (4), S Craig 7, A Murray 6, D Lamming 4 (2). M Horne 13, P Dalley 9+1 (3), J Shipley 5 (3). J Keith 14, G Parr 12+1, M Jacques 11+1, A Crawford 10+3, P Robson 8+1, L Marshall 7+1. J Lemm 12, J Evans 12, T Bowen 11+1 (3), C Blackmore 9+1, A Moore 5(3), J Woodall 4+1, M Evans (2). .
31 August 1986 STOCKPORT v NEWCASTLE British League North Division 2. Away Won 99-79. Newcastle got back to winning ways at Stockport. Starting with a 7-3 in the first race, they ran out comfortable winners by 20 points. Once again solid team work was the key, especially at reserve from Craig and Mills. John Wilson was paid for 19. Even giving away 16 points, the Combination team were not to be outdone, and were winners by 12 points, Craig, Crawford and Gavin Parr unbeaten. R Hayes 16, T Norman 15+1, P Williams 11+2, S Ridgeway 10, L Phillips 10. S Robinson 8+1, M Williams 5 (3), R Williams 4 (3). J Keith 17, J Wilson 16+3, M Parr 16, A Murray 14+2, S Craig 11 (3), M Jacques 9+3, B Mills 8+1 (3), T Kirkup 8+1. R Williams 11, G Johnson 10, D Ashcroft 10, I Williams 6+2, J Jenkins 5, S Ward 4. S Craig 16, A Crawford 15+1, G Parr 14+2, B Mills 13+1, L Marshall 10, M Reid 6. Hull normally have a poor record at Eastfield, however for this meeting they included Edinburgh based veteran John Murphy. 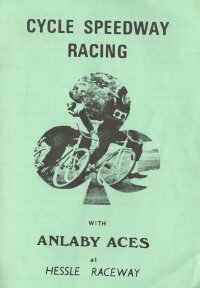 John won his 4 rides, and together with a maximum from Paul Schofield, and 4 wins from brother Andy ran Newcastle close, failing by 10 points. Newcastle were solid throughout, all riders being paid for double figures. An inexperienced side in the Combination meeting saw Hull well beaten. Trivia alert. Hull failed to record a bonus point in both meetings, 30 races. B Mills 15+3, S Craig 15+1, M Jacques 13+3, J Wilson 13, P Robson 11+3, M Parr 10(3), G Parr 9+2, J Keith 9+1 (3). P Schofield 20, A Schofield 17, J Murphy 16 (4), B Ashton 9, A Craven 7,P Adams 6, J Baker 5 (3, J Irvin 5 (4). A Crawford 16, J Keith 15, M Parr 14+2, M Reid 13+1, T Kirkup 10+2, C Brannon 9+2. A Craven 13, J Baker 9, S Murphy 6, H Middleton 5, R Baker 5, A Richardson 4. Next meeting was against table toppers Wednesfield B. A 16 point defeat was due mainly to the three Wednesfield heatleaders, who dropped just 2 points between them. 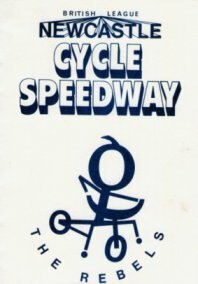 In the combination match, a young Wednesfield team were well beaten on the track, although the home side gave away 23 penalty points still managed to sneak home by 5 points. S Craig 15, M Parr 14, B Mills 12+3, J Wilson 11+1, J Keith 8 (3) G Parr 8 (3), A Crawford 7+2, M Jacques 5+1. Andy Melbourne 19+1, M Pedley 19, K Turley 18+1, A Palmer 11+3,K Nutting 9+1, Ade Melbourne 8+1, J Smith 8 (3), N Pedley 4 (3). G Parr 15, J Keith 14+1, T Kirkup 13+2, M Reed 11, M Jacques 10+3, P Robson 10+1. N Morris 13, S Ward 10, S Woodward 9, S Ward 5 (3), M Bodley 3 (3), J Haycocks 3 (3), J Edge 2 (2). 28 September 1986 SHEFFIELD v NEWCASTLE British League North Division 2 Away Lost 87-89. The meeting at Sheffield turned out to be a nail biting affair. Newcastle held a 5 point lead at the end of heat 13, and were looking likely winners, however a 6-4 and a 7-3 moved Sheffield into a 1 point lead. Dave Robinson and Jason Keith were excluded in heat 16 and a shared heat saw Sheffield 2 points up with 1 race to go. Sheffield's Martin Gamble took the race to finish top scorer with 19 points. The Combination match was a landslide victory against an inexperienced Sheffield team. The only points dropped were when Andy Crawford fell in his first race, and Michael Reed had one third. However, Newcastle gave away 33 penalty points and just won the meeting overall by 9 points. M Gamble 19, G Stringer 16, C Turner 15+2, A Sawbridge 12+2, J Burke 11+2, S Cadman 8, D Robinson 7+1, I Willoughby 1 (1). S Craig 17, J Wilson 17, B Mills 14+1, M Parr 13+1, T Kirkup 8+1 (4), G Parr 7+2 (4), J Keith 6+2, M Jacques 5 (3). 28 September 1986 SHEFFIELD v NEWCASTLE British League North Combination Away Won 81-39 (81-72). P Shale 8 (3), J Fox 8, L Oldroyd 7, A O'Flaherty, 5+1, N Morton 5, P Mason 3 (2), D Dalton 3 (3). T Kirkup 16, J Keith 14+2, M Reed 14 G Parr 13+3 M Jacques 12+4, A Crawford 12+1. The final home league match turned into a fairly easy win, although Chesham put up a good fight for the first 13 heats. Three heat wins in the last 4 heats were enough to see Newcastle home. Topping the score sheet was Michael Parr with a magnificent 20 point maximum. Everyone else chipped in with only Andy Murray not taking a win. Steve Jones and Steve Mills led the way for the Comets. A strong Combination team won well from Chesham who were giving away 29 penalty points. M Parr 20, S Craig 18, J Wilson 13, B Mills 12+2, J Keith 12+1, M Jacques 8+1 (3), T Kirkup 8+1 (4), A Murray 7 (4). S Jones 17, S Mills 16+1, M Hack 14, S Mann 10+2, G Bailey 9+1, M Lewis 7, S Mountaine 5 (3), M Graham 4+1 (3). 5 October 1986 NEWCASTLE v CHESHAM British League North Combination Home Won 67-51 (96-70). G Parr 14+1, M Jacques 13, M Reed 12, T Kirkup 11+3, A Crawford 9+2, A Patterson 8+3. S Mann16, M Lewis 11, M Graham 8, S Mountaine 5+1, J Rand 5, I Marshall 5. A long day's travel to the champions Wednesfield produced a steam roller win for the home team.The Rebels were simply outclassed with only Michael Parr gaining a win. Wednesfield's top 6 only dropping 6 points between them. It was a different result in the Combination match with Newcastle winning well by 15 points, despite maximums from Perry and Smith. The 4 other Aces' riders failed to take a point off the visitors. M Pedley 18+2, A Palmer 17+3, Andy Melbourne 17+3, K Turley 18+1, Ade Melbourne 16+3, K Nutting 16, N Morris 7 (3), S Woodward 7 (3). M Parr 14, S Craig 10, B Mills 9, A Murray 8, J Keith 7+1 (3), J Wilson 6, T Kirkup 6, M Jacques 3 (3). M Perry 16, J Smith 16, S Ward 8, M Bodley 4, J Edge 4, L Pearson 2. A Crawford 12+2, A Patterson 12+1, G Parr 12+1, M Jaques 11+3, D Lamming 11+2, M Reed 10+3. 26 May 1986 Spring Best Pairs. Reds42 J Keith 11(4), A Crawford 10+1(4), M Parr 10(4), P Marshall 6(4), M Jacques 6(4). Rebels 55 B Mills 14(4), S Craig 13(4), J Wilson 13(4), D Lamming 10+3(4), C Brannon 5. 27 July 1986 Challenge meeting ridden due to Stockport failing to travel. Team A 93 S Craig 18+1, B Mills 16+2, J Keith 16, M Jacques 12+1, A Crawford 11+1 J Wilson 11, M Reed 9+1 (4). Team B 79 P Marshall 15, M Parr 14+1, A Murray 14+1, D Lamming 12+1, G Parr 10, C Brannon 7, L Marshall 7 (4 ). P Young 20, J Wallace 20, G Willox 13+2, K Hunter 13, J A Murphy 10+2 (3), J Mitchell 9+1, J S Murphy 7+1, J McMillan 5+1 (3). Copyright © 2011 Keith Dyer. All rights reserved. Advertisers welcome on this site. email for the price.